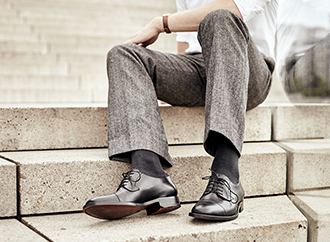 Iconic Heinrich Dinkelacker shoes embody the utmost quality and exclusivity. Even though the cobblers in our Budapest factory only use the best of the best to produce our footwear, even the finest shoes are subjected to natural processes of wear and tear over time. We will continue to assist you following your purchase — simply send us your Heinrich Dinkelacker shoes that are in need of repair, and we will return them to you in mint condition. We provide any necessary repairs at a fair cost. For example, if the soles of your shoes are worn out, we remove the entire sole, including the heel, and completely rework both. We do so using the same materials from which the original sole and heel were made. After the repair has been completed, we will send back the shoes to you free of charge.